We’ve seen some absurd iApps and even a few crazy accessories, but this iPhone and iPod docking station by Portugal-based KMKG Studio just may take the cake. The docking station, aptly dubbed the ‘iTree’, is made from an entire tree that has been hollowed out to create a suspended HiFi sound system. Although the unique design caught our eye, in the end we really couldn’t get over the blatant waste of material to build a tech product that, these days, generally has a shelf life of a couple years at most. And while we wish we could say that the system has been built from fallen or recycled trees, sadly each tree station is a ready-made piece and individuals can place a custom order specifying the type of wood and length they desire. Green fail. at least you admit this isn't green, but what's with all the non-green apple reporting? :)) Indeed, a boa failure. We've seen some absurd iApps and even a few crazy accessories, but this iPhone and iPod docking station by Portugal-based KMKG Studio just may take the cake. 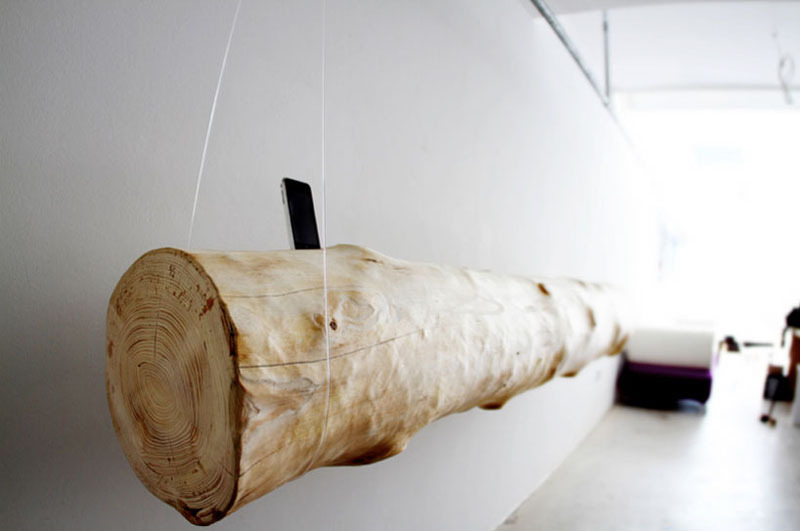 The docking station, aptly dubbed the 'iTree', is made from an entire tree that has been hollowed out to create a suspended HiFi sound system. Although the unique design caught our eye, in the end we really couldn’t get over the blatant waste of material to build a tech product that, these days, generally has a shelf life of a couple years at most. And while we wish we could say that the system has been built from fallen or recycled trees, sadly each tree station is a ready-made piece and individuals can place a custom order specifying the type of wood and length they desire. Green fail.